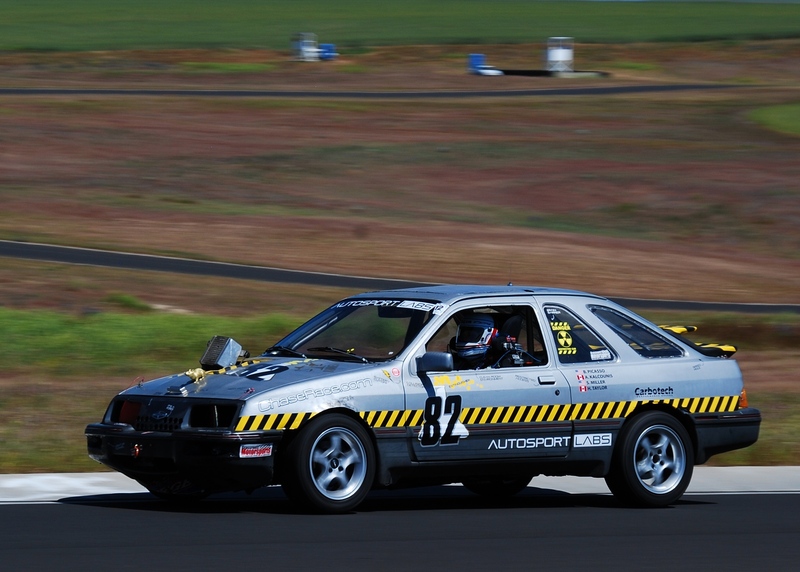 Friend of StartingGrid, Doug Chase – Chief Everything Officer of Chase Race, drove in last week’s 24 Hours of LeMons event at Sears Point Infineon Raceway. He was driving the Autosport Labs Merkur “Lab Rat”, which is pictured above and is worth a post just highlighting its unique features – live telemetry in a $500 crap can racer!. Doug recently said the following about being behind the wheel of the Lab Rat and it resonated with me as a great explanation of what racing really feels like. “Last Saturday I spent two hours at the wheel of a race car, and it was the most relaxed that I had felt in months. Never mind that we were racing in the rain, or that the windshield wipers broke, or that there were 170 other cars on track. At that moment, nothing else in the world matters. Work is gone. The internet is gone. I couldn’t answer the phone if I wanted to. For those two hours the only thing that mattered was piloting the race car, a task that happens to be quite fun, and that I happen to be reasonably good at. When my stint was up and it was time to come in and change drivers, I climbed out of the car relaxed, refreshed, and feeling more at peace than I had felt in a long time. Then Sunday we did it all again, except without the rain. This entry was posted in Motorsport Media and tagged 24 hours of LeMons, Autosport Labs, Chase Race, Doug Chase, Memorable Quotes. I wish I had said that. Bookmark the permalink.